Disclaimer: This post contains affiliate links. I MAY receive a small commission, at no extra cost to you, should you buy any products via these links. But, as always, all thoughts, opinions, and ideas are my own. Thanks for supporting The Crafty Cat Company! But, as I mentioned in my last post, many retailers are already putting out their fall merchandise offerings. This means we get to think ahead to cooler fall days and the upcoming holiday season! And, of course, plan ahead for our decorating and crafting too. New autumn items are hitting shelves, so this means that many of the spring and summer items are now being shuffled to the clearance racks… which is actually where I found these cute little painted metal buckets! 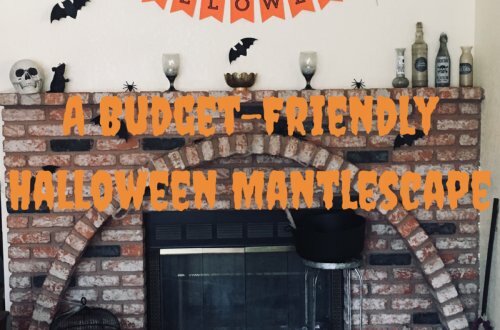 Yep, they weren’t actually intended to be for fall/Halloween at all! While browsing the aisles of Hobby Lobby, I noticed that their Spring Shop collection (what was left of it, anyway) was on clearance for a deep discount. Items that remained consisted of miniature metal containers, in the form of buckets, milk jugs, and little watering cans. (I grabbed a couple of these too). And being “spring” products, most things were in traditional seasonal colors, such as blue, green, pink… oh, and orange too! Once I saw the tiny orange pails, I immediately envisioned some sort of Halloween-ish, Jack-O-Lantern project. I hurriedly scooped up 8 of them, and seeing as how they were 90% off (!!!) in store, figured I could sort out the details later. 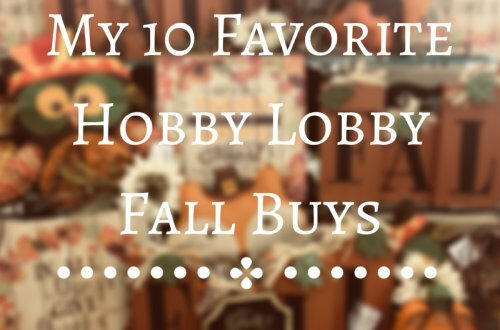 Part of the reason I’m sharing this with you now is because your local Hobby Lobby store may also still have some of their spring decor on hand, so if you want to attempt this project, it can’t hurt to save some money doing it! And on the plus side, if your store has already been wiped out, the exact buckets I used are still available online for 80% off (as of this writing!). 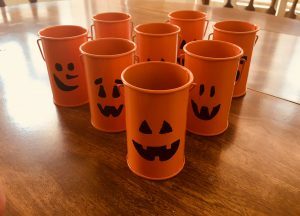 These Mini Jack-O-Lantern Pails are a versatile little item to have around during the fall season. 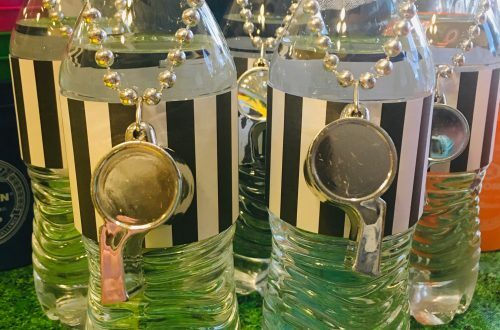 You can use them as candle holders, or perhaps party favor or snack containers. 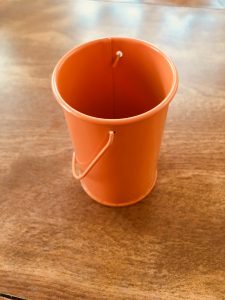 And it’s a quick, simple project too… requiring only 4 items total, including the buckets! Pretty easy. 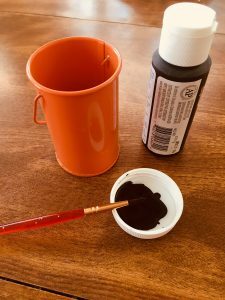 Just squirt some paint into your disposable container of choice, and paint away! I didn’t follow any set designs or ideas, but painted whatever came to mind. You can make your pails all the same, or have each one be different, like I did… it’s up to you! I made sure to paint the same area on all the pails, with the seam in the metal facing all the same way (to the right)… purely for aesthetic/symmetry purposes. But this is entirely optional. The other tip I have, is to outline the facial features on the Jack-O-Lanterns first, then do the fill-in last. Also, since these are small containers, and the faces will be small as well, it’s important to use a thin paintbrush with a fine point. And to not glob too much paint onto your brush at once. Take just a little at a time, and things will be a lot easier… not to mention, less messy! 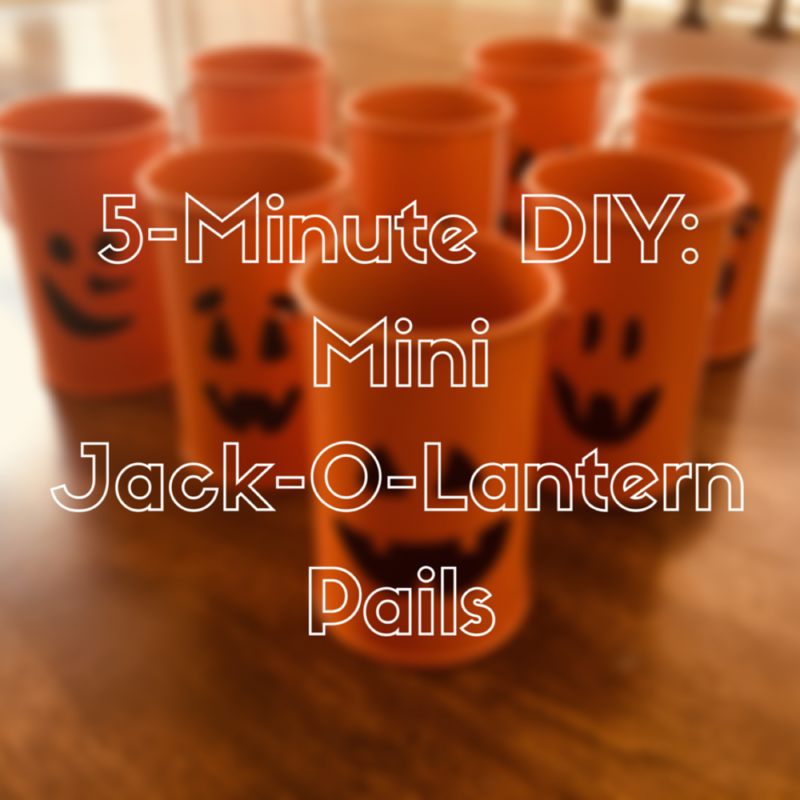 Let your little Jack-O-Lanterns dry for at least an hour. And use them however you see fit! Don’t be afraid to get creative!